The Chemical Society of Washington (CSW) is the local ACS Section for the Washington, DC area and serves approximately 4,000 members. The American Chemistry Society established the National Historic Chemical Landmarks program in 1992 to enhance public appreciation for the contributions of the chemical sciences to modern life in the United States and to encourage a sense of pride in their practitioners. 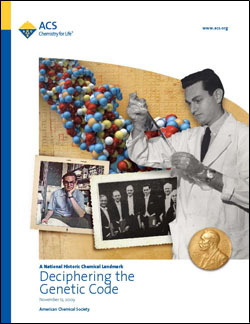 The program does this by recognizing seminal achievements in the chemical sciences, recording their histories, and providing information and resources about Landmark achievements. In this building, Marshall Nirenberg and Heinrich Matthaei discovered the key to breaking the genetic code when they conducted an experiment using a synthetic RNA chain of multiple units of uracil to instruct a chain of amino acids to add phenylalanine. The uracil (poly-U) served as a messenger directing protein synthesis. This experiment demonstrated that messenger RNA transcribes genetic information from DNA, regulating the assembly of amino acids into complex proteins. Nirenberg would go on to decipher the code by demonstrating the correspondence of various trinucleotides to individual amino acids. He was a co-winner of the Nobel Prize in 1968. 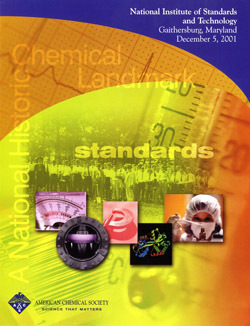 For one hundred years, scientists and engineers at the National Institute of Standards and Technology (formerly the National Bureau of Standards) have made broad-based and comprehensive contributions to chemical science and technology and to the economic strength and competitiveness of the United States. Through internationally recognized programs in materials characterization and standards, measurement, calibration, and synthesis—and in areas as diverse as cryogenics, weather prediction, solid state devices, and synthetic rubber—the National Institute of Standards and Technology continues to demonstrate that the intelligent application of research in physical sciences to a wide range of societal challenges contributes to a higher quality of life for everyone. Dedicated November 9, 1993, at the National Museum of American History in Washington, D.C. 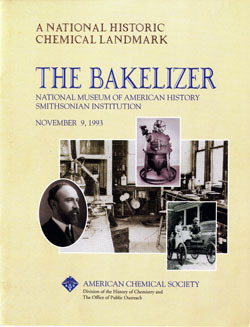 The National Museum of American History houses the original Bakelizer, the steam pressure vessel used by chemist-entrepreneur Leo Hendrik Baekeland to commercialize his discovery of Bakelite—the world’s first completely synthetic plastic. Phenol and formaldehyde reacted under pressure at high temperature in this sealed autoclave (ca. 1909) to form the thermosetting resin Bakelite. Versatile and readily molded, Bakelite found wide use in the expanding consumer economy and opened the door to an era of synthetic materials. In April 1963 we are celebrating the 70th anniversary of the Washington Section of the American Chemical Society; and next year we shall celebrate the 80th anniversary of the founding of the Chemical Society of Washington. It is necessary to delve into history prior to the establishment of the Washington Section of the American Chemical Society to fully understand the importance of the creation of the Washington Section, whose 70th birthday is being celebrated at the 654th meeting of the Section on April 11 next. (This is also the 721st meeting of the Chemical Society of Washington). The organization of the American Association for the Advancement of Science in 1848 led to the creation of sections and eventually to separate societies in many areas. As early as 1850, a section on chemistry was recognized in its program, and in 1873 there was organized a chemical branch of the Association. Among the participants in this group were seven future American Chemical Society presidents, including William McMurtrie, Frank W. Clarke, Harvey W. Wiley, and Charles E. Munroe, who were, or subsequently became, active members of the Washington Section of the American Chemical Society. At the Northumberland centennial Celebration of Priestley’s discovery of oxygen (1874), it was proposed that a national chemical society be organized. D This was opposed by Lawrence Smith, Frank W. Clarke, and others who felt that the chemical section of the American Association for the Advancement of Science afforded a better opportunity to bring chemists together. In 1876, however, Professor Charles F. Chandler of Columbia University issued an invitation to a group to assemble for the purpose of organizing an American Chemical Society. It is interesting to note that, while the original invitation implied a “local” society, a subsequent invitation, two months later, noted that the local character first proposed was being broadened and that a “national” society should be organized. Unfortunately, the organizing committee and the structure of the proposed society were not nationalized at the same time, and many who joined from outside of New York City were disappointed in the local character and limitations of “resident” and “non-resident” membership, as well as limitation of offices to a certain proportion of New York residents. Clarke, Wiley, McMurtrie, and Munroe joined the new society as “non-resident”” members in the year of its founding (1876); and William F. Hillebrand joined in 1879. Many persons indicated their unhappiness over the disenfranchisement of non-resident members and the local character of the society. Clarke, Wiley, Hillebrand, and McMurtrie, in fact, led a secession from the American Chemical Society. By coincidence, Clarke and Wiley, who had been classmates at Harvard and were employed in the Midwest (Purdue and Cincinnati, respectively), both accepted appointments in Washington in 1883. Thus there was a simultaneous concentration of the essential power to force a reorganization in the American chemical Society. Their first move was to organize a chemical Society of Washington, which was initiated in January 1884. Almost immediately, the new group prospered at the expense of the American Chemical Society (New York group), and by 1886 there were no longer any American chemical Society members in the Washington area. At the time that CSW was organized, Wiley was also instrumental in the creation of the Association of Official Agricultural Chemists. Both Wiley and Clarke were very active as well in the Chemistry Section of the American Association for the Advancement of Science, which also was prospering. By 1890, with the aid of Munroe, it had been decided that a truly national chemical society should be established. Munroe, who was then at Brown University in Providence, R. I., had maintained his American Chemical Society membership; but he also sympathized with the secessionists and, in fact, there is reason to believe that Munroe, Clarke, Wiley, and others in Washington were working together to create a national society. Munroe felt that the existing American Chemical Society in New York could be broadened into a national society; and as a first step, he induced the New York group to hold an out-of-town meeting in Providence. This meeting was highly successful and as much more national in character than the monthly New York City meetings. The first American Chemical Society bylaws provided that a quorum of 15 would be necessary for business, but some six meetings went by with no quorum. When a quorum was finally obtained, the bylaws were changed to reduce the quorum requirement to 10. It has always been a problem to create a “national” society in name, but at the same time to hold meetings each month in a single place. Members outside of the city cannot afford to attend regularly. Even today, the local sections of the American Chemical Society in the larger cities find that interest in and attendance at monthly meetings are proportionately less than at local section meetings in small communities. In 1890, Clarke and Wiley decided to make a major effort to create a truly national chemical society. The American Association for the Advancement of Science was to meet in August 1891, in Washington, and Clarke was heading the Chemistry Division. Wiley, as part president and secretary of the Association of Official Agricultural Chemists, had arranged to have this organization hold its meeting in Washington at the same time. Clarke, although not a member of the American Chemical Society (New York), invited that organization to hold its third out-of-town meeting in Washington immediately following the AAAS meeting. Clarke’s invitation was accepted, and there was thus concentrated with the Chemical Society of Washington a distinguished array of national leaders in chemistry. In essence, a new society was created by the Wiley-Clarke-Munroe secession activities, in which the name was absorbed from the New York group, and the Chemical Society of Washington and the New York group both became sections of the national society. The golden era of 1893 to 1908 saw five members of the Washington Section serving as president of the American Chemical Society. These were Harvey W. Wiley (1893 and 1894); Charles E. Munroe (who moved to Washington in 1893) (1898); William McMurtrie (1900); Frank W. Clarke (1901); and William F. Hillebrand (1906. Since the end of Hillebrand’s term of office in 1906, the prestige and role of the government scientist in the Society has waned, and no other governmental scientist has held this influential position in Society affairs. Several “near misses” have been recorded, in which former Washington Section members rose to eminence after they left the government. W. A. Noyes, Sr., was a member of the local section from 1903-1907, during which time, in addition to serving as chief chemist of the National Bureau of Standards, he was national secretary of the American Chemical Society, editor of the Journal of the American Chemical Society, and creator and editor of the first volumes of Chemical Abstracts. He became president of the American Chemical Society in 1920, while serving as chairman of the Department of Chemistry of the University of Illinois, when few associated him as a former government scientist. Again, in 1940, S. C. Lind served as president. He was then director of the School of Chemistry of the University of Minnesota, and few recalled his Washington sojourn as chief chemist at the Bureau of Mines (1918 to 1923), a position which C. L. Parsons held from 1911 to 1917, while serving as national secretary of the American Chemical Society. For some 14 years of the Society’s history, the secretary of the Society was a government scientist and maintained his office in government quarters. In fact, since the move of the Society headquarters to Washington in 1903, the Secretary has always been a scientist who has at one time or another served “time” as a career government scientist. In recent years, presidents of the American Chemical Society have come to Washington (to become members of the Washington Section) after completion of their normal tour of duty in industry or university, to accept advisory or directive position in the government to guide or advise the career government scientist on his activities; but no career government scientists have served as president even though some 15 percent of the nation’s chemists are government employees, while 21 percent are academic and 64 percent industrial. The five principal founding participants mentioned above-Wiley, McMurtrie, Clark, Munroe, and Hillebrand-lived to an average age of 80. The last of them, Munroe, died in 1938 at the age of 89; he was at that time the last surviving charter member of the American Chemical Society, having been a member for 62 years. There are many members of the ACS Washington Section who can today, with pride, lay claim to personal acquaintance with several of these leaders who were instrumental in the founding of both the ACS Washington Section and the Chemical Society of Washington. Perhaps it is well that the Washington Section of the American Chemical Society maintains its dual identity, and not only serves as a strong participant in the national chemical organization, but also retain the independent spirit of its founders in promoting a recognition of responsibilities and activity among the local members of the Society. * The Republic of Texas, in joining the Union, reserved certain actions, such as further subdivision, to its own future decision. Source: Wallace R. Brode, The Capital Chemist, April 1963, pp. 89-92. Browne, C. A. A History of the American Chemical Society-Seventy-five eventful years. American Chemical Society, Washington, 1952. Brode, Wallace R. American Chemical Society address-From pre-P.O. box to the present. (Part of a dedication address at the ACS building dedication ceremonies, October 7, 1960.) Chem. Eng. News, 83, 114 (October 31, 1960). Brode, Wallace R. Harvey W. Wiley and our national science policy. (Banquet address at 74th annual meeting of the Association of Official Agricultural Chemists, October 10, 1960.) J. Assoc. Official Agr. Chem. 44, 111 (1961).